Farley LaserLab's DM Contour CNC CO2 laser cutting machine is designed for heavy industrial laser cutting, with a laser source up to 6kW CO2 Laser and a transfer table to give both speed and efficiency to give your business a step into the future. The $450,000 package includes the DM Contour machine, External Cover (required for Australia), Rofin DCO20 2000W CO2 laser, Laser Water Chiller, Siemens Drives & Motors, Siemens CNC Controller, Cutting Table 3m x 1.5m, Transfer Table and the Precitec Laser Cutting Head. The proven, reliable and affordable laser cutting system, with automatic transfer table and excellent accessibility. 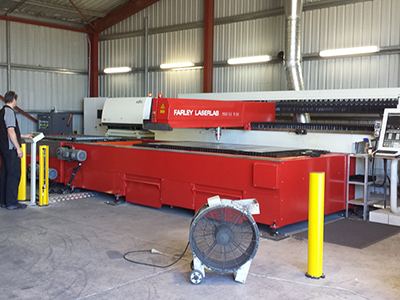 The Farley Laserlab Contour DM provides Laser cutting at a repeatable high performance level, with gantry structure, cast Al beam and double side rack and pinion driving system, which supply the machines with high dynamic response speed and 1G acceleration to make sure the corner cutting quality. Exceptional mechanical design, time proven worldwide supported Siemens 840D control system and German made speed reducer and matched skew gear moving structure are some of the many featured that allow for the machines' single axis maximum running speed up to 120m/min and max. combined speeds up to 165m/min while maintaining stability and precision. The Contour DM can process plate up to 2m (6') wide and 6m (12') long in one set up, and can be programmed to automatically transfer new material to the processing station via the fully automated transfer table.